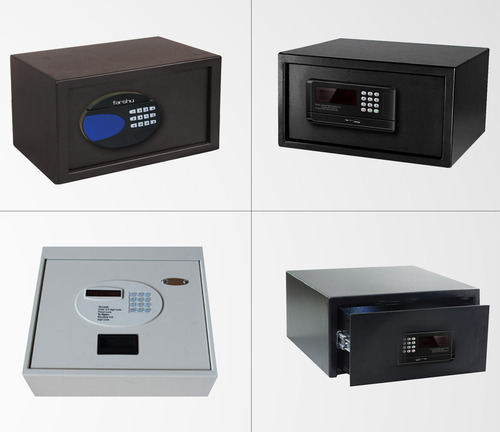 When it comes to in-room safety, you need FARSHU digital safes. More than ever your business guests expect a combination of security and convenience which FARSHU offers through its state-of-the-art digital locking solutions; powered with advanced microprocessors and most rugged design to suit the security needs of the guests providing maximum security giving you a sense of security. Security solutions go way beyond recommending hardware. FARSHU understands the expected demands and standards of the hospitality industry and gives you a number of extended benefits to enhance services to your in-house guests. The logger unit of the safe is a non-volatile memory system ensuring the secrecy of the passwords even during the absence of battery drives power and also empowers the authorized hotel staff for emergency overrides. It’s applauded attributes and recognition will make you feel at home with finest equipment backed by a professional network of subsidiaries and trained distributors. Established in 1997, "Alsha Hotel Supplies Pvt. Ltd." has scaled the height progress in industry due to its capability of providing desirable product range and making crystal clear dealings with the customers. We are a private owned company, commenced operations as a manufacturer, trader, exporter and supplier of an extensive array of:and many others. We give pivotal importance to the quality of products and to maintain the same, several stringent quality guidelines as well as policies are adopted by us. It is just because of the reliability and better quality of our products that we have successfully expanded distribution network all over the nation. Apart from this, we keep ourselves aware with the market preferences by regularly conducting surveys of market. Along with this, we implement cutting-edge technology to surpass the ever rising and upcoming specifications of our esteemed clientele. We are also having our international branch office at Hongkong and Singapore.